Despite the piles of snow and ice still covering the ground here in Michigan, I've been working on some new spring designs -- something to bring a pop of color and whimsy into this stark, white landscape. I created all of these new crocheted jewelry pieces by using very thin copper wire (30 or 32 gauge) worked in tandem with some type of fiber (wool yarn, cotton thread, metallic thread), and all of them feature flowers. So, today's post is just a little photo "show and tell" of what I've come up with, so far, in my "Copper Garden" Collection. All of these beauties are currently blooming in my display at The Yellow Door Art Market. Enjoy a breath of spring! 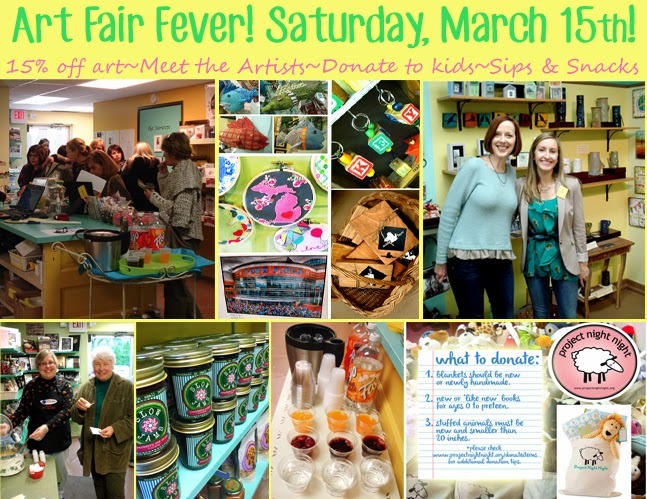 If you are in the area and get the chance, I hope you will stop by The Yellow Door Art Market next Saturday, March 15, 2014 for Art Fair Fever! It's a great time to see lots of new spring designs by local Michigan artists, like my Copper Garden Collection, and to meet many of the artists, too. I plan to be there that morning, and I am looking forward to talking with people and seeing all the new creations. Bring a blanket, a children's book, or a stuffed toy to donate to Project Night Night. And all the art in the store is 15% off! !